Dear Readers! Have you ever tried self-made ice? I haven't. I was always too afraid of salmonellae in eggs that I always tried to avoid it. And I am not an ice lover. But what brought me to this idea? The weather! The first thing I saw when I got up was a white blanket of snow that covered the World outside my windows. After the rain yesterday and temperatures around 0°C/32°F I thought it might be glaze ice today. But no! It was snowing during the night. As I said I am not in ice (and snow is somehow ice...) but there was something magic about it. My great mood of the last weeks keeps me smiling and I smiled seeing that snow outside! Really! It's not very common that we have snow here. We're here under the influence of the maritime climate with warm (sometimes hot) Summers and not too cold winters with a lot of rain and fog and temperatures around 5°C/41°F. Only sometimes the continental climate from over Russia influences our weather - like last year when we were "blessed" with temperatures of -20°C/-4°F for a couple of weeks. That was the time I thought I'm gonna die. Not used to such temperatures - it was the real horror! But this year we have the typical winter back and since yesterday even some snow. Because of the snow I did not had the feeling that's cold! While waiting for my bus on my way to work, I watched the people, the cars, the traffic and the world around me. It was so beautiful. White and so bright! I do not have to mention that the last time I saw some sun was about 3 weeks ago and the days were cloudy and foggy and today: brightness came over us. 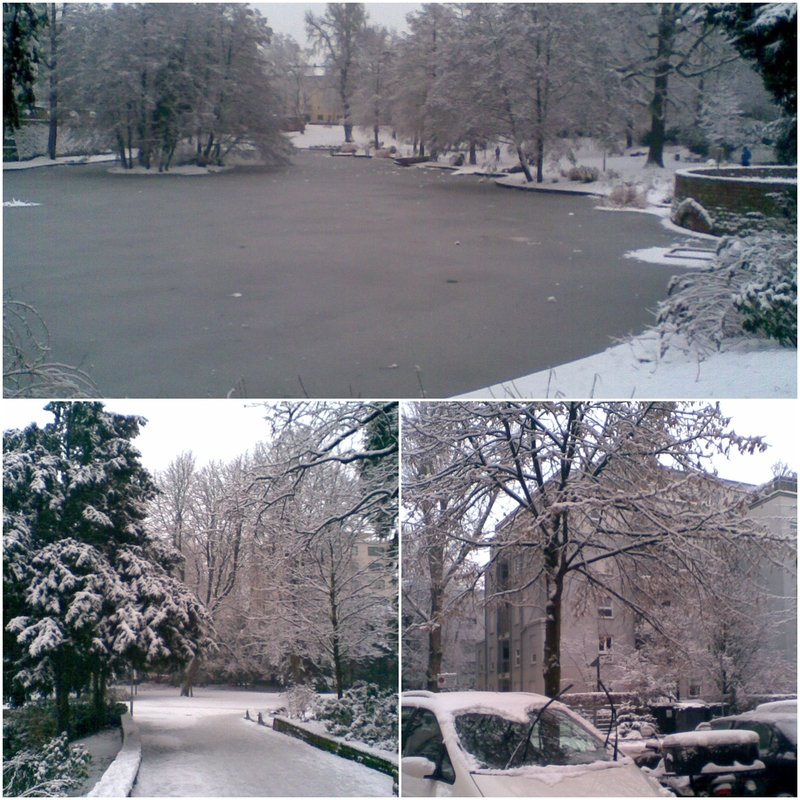 That great feeling was worth that little snow which killed nearly the whole public traffic in Frankfurt for hours. Trams, the underground and the suburban railways were delayed or were cancelled and in the evening I saw on TV all those people on Germany's biggest airport, just a few miles from my home, sleeping on camp beds waiting until their cancelled planes will bring them far away from that traffic chaos. And everything because of some rain yesterday and some snow. Amazing! No, the most amazing was an Intercity-Express (that white super fast trains) passing my overground metro station - the pantograph caused flashes and a magic cloud of snow the train blew away covered us all waiting on the station. That was amazing! Coming home at 5, I was walking through a park. Imagine a frozen lake, and a snow blanket on the trees, paths and benches. In my head I started singing "Walkin' in a Winter Wonderland". It was so great that I took some pictures with my mobile I would like to share with you - they look dark, but it was getting dark already. And since 1 minute, we're writing the 22nd of January and the official sun set for here is exactly 5 pm. I was waiting for that moment since Christmas! The days are longer - every day one minute and since today it'll get really dark at half past five ;). I'm wondering what's happening with me this year! No winter depression, great mood, a healthy portion of optimism, great plans for the next months and and and and. How I missed that feeling a year ago... So that's what we call a good wink from the destiny? I must confess: I enjoy it. Thank you! And even if that's an off-topic, I'd like to report from my kitchen, that I was trying to make some ajvar yesterday. Trying because the bell pepper looked so tasty that I gave up finishing it and used it for my dinner and lunch today. But I'll come back to Ajvar, a great recipe Jay (who I met after a looong time again) gave me a couple of weeks ago. Maybe on Friday. During the week I have not a lot of time for experiments - I'm cooking healthy but fast and easy dishes out of my great collection I have in my head and I am as well working hard on my final legal thesis I have to finish until March. Someone's interested in it's topic? It's about legal problems in the Middle Eastern family law systems - with a special focus on Bioethics and in-vitro fertilization. Boring for you - SUPER INTERESTING to me ;). So I can't report any other kitchen experiments at this moment, I HAVE NO TIME.